Visby [ˈviːsbʏ] is a locality and the seat of Gotland Municipality in Gotland County, on the island of Gotland, Sweden with 23,880 inhabitants, as of 2014. Visby is also the episcopal see for the Diocese of Visby. The Hanseatic city of Visby is arguably the best-preserved medieval city in Scandinavia and since 1995, it is on the UNESCO World Heritage Site list. Among the most notable historical remains are the 3.4 km (2.1 mi) long town wall that encircles the town center, and a number of church ruins. Visby is a popular vacation destination for Scandinavians during the summer and receives thousands of tourists every year. It is by far the most populated locality outside the Swedish mainland. The University of Gotland is in Visby, and since 1 July 2013, it is a department of Uppsala University under the name Uppsala university–Campus Gotland. Visby is also the sole county seat in Sweden only accessible by boat and air. The name "Visby" comes from the Old Norse Vis, (genitive singular of Vi) meaning "(pagan) place of sacrifices", and by, meaning "village". In the Gutasagan (mid 14th century) the place is referred to as just Wi meaning "holy place, place of worship". Visby is sometimes called "The City of Roses" or "The City of Ruins". In the 12th century, Visby Cathedral, dedicated to Saint Mary, was constructed. It was reshaped in the 13th century to its current appearance, and was officially opened in 1225, by the bishop of the Swedish city of Linköping. Several other churches were also constructed in the ensuing centuries. The city flourished, thanks to the German Hanseatic League. The work on the ring wall was likely begun in the 12th century. Around 1300, it was rebuilt to reach its current height, acquiring the characteristic towers, although some towers were not constructed until the 15th century. The ringwall is still largely intact. In the first half of the fourteenth century (1300-1350) Visby was at the height of its wealth and influence, and it was during this time that Laws of Wisbuy, a set of maritime laws that had broad influence in the Baltic and beyond, were probably promulgated. In 1361, Gotland was conquered by Valdemar IV of Denmark. 1,800 Gotlanders were killed in battle in front of the city. Valdemar tore down part of the wall, set up three huge beer barrels and threatened to turn his men loose to pillage the town unless they were filled with silver and gold. The Visby city fathers fulfilled the demand, with churches stripped of their valuables. Valdemar added "King of Gotland" to his title list. His treatment of Visby, a member of the Hanseatic League, precipitated that League into war with Denmark; however, though Valdemar was forced into various concessions, he retained Visby as a Danish city. In 1391, 1394 and 1398, it was taken and plundered by the Victual Brothers, pirates who sailed the Baltic Sea. An invading army of Teutonic Knights conquered Gotland in 1398, destroyed Visby and expelled the Victual Brothers. In 1409, Grand Master Ulrich von Jungingen of the Teutonic Knights guaranteed peace with the Kalmar Union of Scandinavia by selling the island of Gotland to Queen Margaret of Denmark, Norway and Sweden. In 1411, the Norwegian, Danish and Swedish King Eric of Pomerania had the castle of Visborg constructed, and settled himself there for twelve years, during which the city virtually became a pirates' nest, and the commerce halted. As of 1470, the Hanseatic League rescinded Visby's status as a Hanseatic town. In 1525, the final blow came. In the Danish throne quarrel, the Lübeck, a Free City of the Holy Roman Empire and a leading member of the Hanseatic League, supported Frederick I, while Søren Norby the Danish governor of Gotland fought for Christian II, even after Christian's official resigniatio in 1523. While Norby fought a military action in Sweden, the Lübeckers successfully attacked Visby and set the city on fire from four sites. But unlike widespread belief, several churches survived for first. The churches of St. James (which already had been closed before), St. Nicholas and St. Gertrude were sacked by Lübeck's army. With the reformation, all churches except St. John, which became the city parish, were closed. In 1528, the citizens of Visby sacked the ruler's church (Swedish: Drotten) in revenge for the plundering of their town. In 1533–34, the new Danish governor, Henrik Nielsen Rosenkrantz, demolished St. John's and St. Peter's churches to improve the defence of his castle Visborgs slott. St. Mary's Cathedral remained the last functional church and became the new city parish. 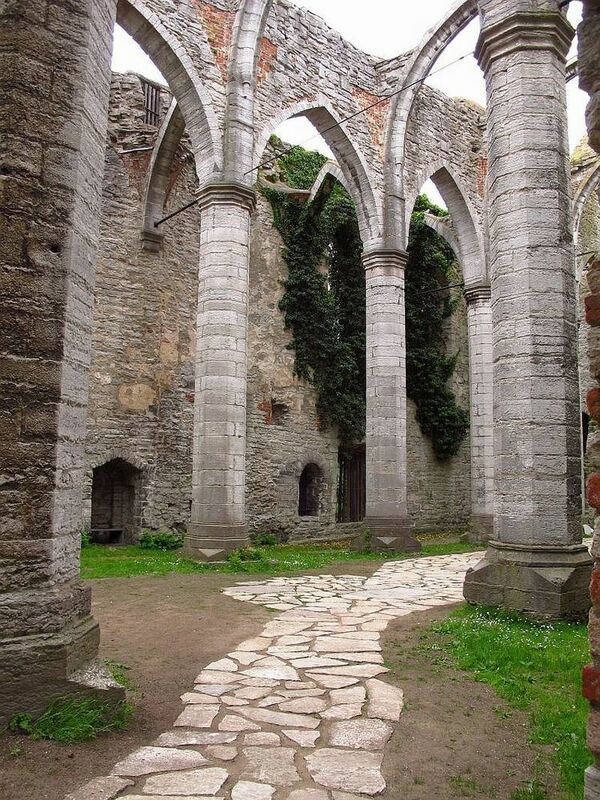 Though the destruction of the churches of Visby happened more than 480 years ago, some of them are still in a better stage, than many Polish and German churches that meanwhile have been reconstructed were in the end of World War II. Gotland was again taken into Sweden's possession in 1645, by the Treaty of Brömsebro, after 300 years of Danish rule. The city developed slowly as things were left as they were. In the mid 18th century, after a plague had reduced Visby's population, some attempts were made by Swedish government officials to improve living standards, but little was accomplished. Not until the early 19th century did Visby once again attract commerce and a harbour industry. At the same time – 1808 – Gotland was conquered by Russia, but was peacefully taken back by the Swedes after only a couple of months. Visby is the name of the locality, or town, as well as the name of the larger area surrounding it, Visby socken. In 1936, the socken was incorporated within the newly formed Visby stad (Visby city), the only locality with historical city status on Gotland. On 1 January 2016, it was reconstituted into the administrative area Visby domkyrkodistrikt. Visby is also the only municipality seat of Sweden that is accessible only by boat and air traffic. Visby is situated on the central west coast of Gotland, on the rather steep slopes of limestone cliffs surrounding the first natural harbor. The town has evolved around the medieval harbor that now constitutes the Almedalen park. Long streets run parallel with the old shoreline with shorter alleys at a straight angle from these, lead from the harbor and up the slope up to the eastern higher part of town known as Klinten. The old, original part of Visby is more or less enclosed by the city wall to the north, east and south, with the old harbor and the Baltic Sea in the west. The more modern parts of the town expand mostly east and inland from the wall. Along the shore south of the wall is the modern harbor with its ferry terminals and further south is a green recreational area called Södra Hällarna. Just inside the north part of the wall as well as along the north coast outside the wall, are several beaches: Kallbadhuset, Norderstrand, Snäckgärdsbaden (or simply Snäck) and Gustavsvik. Visby and Tallinn are the only two North-European towns in which the city's medieval grid plan has been fully preserved into present day. One of the asteroids in the asteroid belt, 6102 Visby, is named after this place. Visby is linked to the mainland of Sweden by ferry and by plane. Ferries arrive from both Oskarshamn in Småland and Nynäshamn, near Stockholm, each taking about three hours. The ferries are run by Destination Gotland and subsidized by the Swedish government. Since 2016, there are also ferries to Västervik during summer, run by the independent shipping company Gotlandsbåten. Visby Airport is located about 5 km (3.1 mi) north of the city and offers connections to the Swedish main land. With 276,000 passengers in 2005, it is the 12th largest airport in Sweden. There are also city buses in Visby as well as buses to other parts of Gotland. Visby gave its name to the 1968 Visby Amendments, which were an amendment of the Hague Rules of shipping law, leading to the Hague–Visby Rules. During the first week of July, Visby is the scene of the Almedalen Week, an important forum for everyone involved in Swedish politics. During the week, representatives from the major political parties in Sweden take turns giving speeches in the Almedalen park. In August, the tourist season is at its peak. During week 32, from Sunday to Sunday, the annual Medieval Week on Gotland is held. During this week regularly dressed tourists are outnumbered by people dressed in Medieval costumes. The festival started in 1984. There are a variety of events: music, jesters, theatre, a medieval market, jousting tournaments and much more. The headquarter of the World Ecological Forum is in Visby. Swedish author Mari Jungstedt has set nine detective novels on the island of Gotland. The principal character, DS Anders Knutas, is based at police headquarters in Visby, and there are numerous descriptive passages of the city and the island. Hayao Miyazaki noted that Visby is the main visual inspiration for the town in Kiki's Delivery Service, with elements of other locations such as Stockholm also blended in. In 1971 Ingmar Bergman filmed The Touch (1971) (Beröringen) with Bibi Andersson, Max von Sydow and Elliott Gould in Visby.